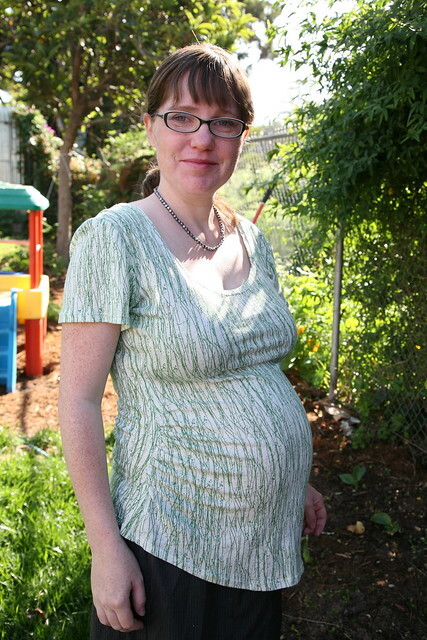 Inder Loves Folk Art: Ruched Maternity Top. When I heard that Megan Nielsen, clothing designer and purveyor of awesome maternity patterns (including the Rie Dress, which I used to make a top a while back), was moving back to Australia and closing her shop for a month, I decided I better buy a couple more of her patterns before I was too pregnant to care about making my own maternity clothing anymore. I skated in right under the shop-closure deadline (in case you are in the market for maternity patterns, you can still buy her patterns through several retailers who carry them), and was pleased to receive a little package in the mail the other containing patterns for the Ruched Maternity T-Shirt and the Pina Dress. Exciting! In order to justify these purchases, I wasted no time sewing up the Ruched T-Shirt for myself. After all, I have only ten to twelve more weeks in which to enjoy wearing maternity tops (to the extent one can "enjoy" wearing maternity clothing), so some hustle is required. So. Wow. I love this pattern. Right after this shot was taken, I headed off to work, not realizing my skirt was so wrinkled! Oh well. It is so easy to sew up (especially now that I have conquered tricky rayon knits) and it fits like a dream! This is a size medium (based on my current bust size; I dare not measure my "waist" at this point), with zero changes or modifications. Perfect (with room for expansion). How often does that happen? I have to say, I really love this knit, too, and I can't believe it was such a score. Finding lovely knits, especially printed knits, is not easy, especially when your tastes are as particular as mine! This stuff is soft, light, and diaphanous, although thankfully not as difficult to wrangle through a sewing machine as another rayon knit I've worked with. And I love this abstract green print - somehow, it helps makes this casual style seem a little more work-appropriate. And here's a detail of the ruching along the side. This top is nice and long in the front, which means I still have quite a bit of room to expand before this top starts inching up over the big belly. What you can't see in this photo are the now very visible (and okay, slightly freaky if you're not used to such things) movements and kicks of the baby girl within! It has been party-central in there lately. Baby girl has been keeping me up at night with her gymnastics. So now I'm torn: Part of me wants to make like four more of these, because this is just the best maternity top pattern ever. But part of me wants to move on to the Pina Dress, because that pattern looks awesome too! Both of these plans probably involve buying yet more fabric. Luckily, I have arrived at a (temporary) solution: Do neither. Make a billion pairs of baby pants. Gorgeous top! Ruching + pregnant belly = win. I love that print! Do you have any left to make into baby pants? I concur that the best solution is baby pants. Or dare I say baby dresses. Pink baby dresses? Ok how about orange or striped? Anyhoo, the top looks great, can't wait to see the dress! You are rocking maternity wear. When I was pg, it was all about shawls and not being photographed, ha! I do have some leftover, enough to make myself a NON-maternity tank top after this baby is born, I fancy. :-) Babies should be dressed in lovely soft knits, but I'm thinking not so much lovely soft RAYON knits. That's for mama. Hehe. 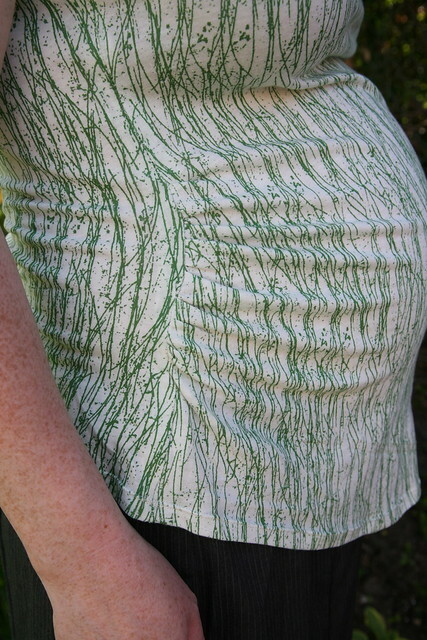 I love that print and it makes for delightful maternity top! Very flattering. Thank you! 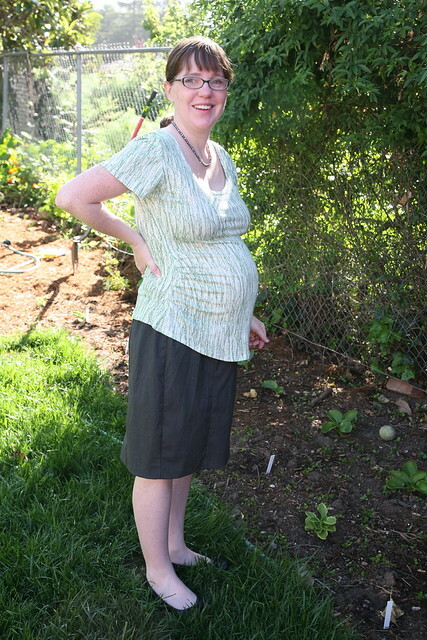 "Flattering" is a term I don't hear thrown around a lot about maternity clothing, so that is a huge compliment! Oh, it's lovely! You look fab! Working with knit fabric is kind of addictive isn't it.... Well you do certainly have to make the dress, now you have the pattern. Thank you! Yep, it's coming up next ... after I make ONE MORE PAIR of baby pants. Ahem. that fabric is amazing! the shirt looks very professional/boutique. i have had some trouble learning knits. yours look great! Thank you! It's definitely been a learning curve for me too! Gorgeous fabric put to good use and it does look very comfortable. Can't wait to see the dress...eventually. Thanks! I'm geering up to work on the dress, I promise! Holy adorable! It's so cute it almost makes me want to be pregnant, almost. Gorgeous fabric and such a bargain too. I love the Megan Nielsen patterns and that top looks fantastic. I loved feeling the little kicks. OMG,you are having a girl!!!!!!!!!!! !